Blurb Description: Priyanka Das has so many unanswered questions: Why did her mother abandon her home in India years ago? What was it like there? And most importantly, who is her father, and why did her mom leave him behind? But Pri's mom avoids these questions--the topic of India is permanently closed. 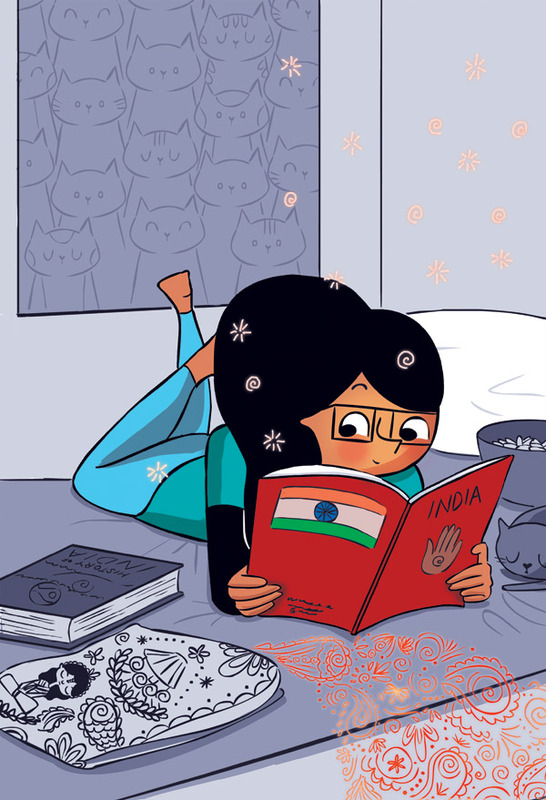 A graphic novel about a magical Pashmina that takes an Indian American teenager home to the country she’s always wanted to see? HECK YES. I read the entirety of Pashmina in under an hour and I quite loved it. I WAS SO SOLD ON WHAT THIS BOOK WAS BASED ON. I absolutely love travelling my own country and coming across these hidden jewels of places and the FOOD here is ABSOLUTELY delicious. This book combined the complicatedness of a mother-daughter relationship, with the understanding of one’s identity and home and all it the form of adorable graphics and I LOVED IT! Both of these were absolutely spectacular, the illustrations in particular. I feel like graphic novels are SO SO underrated and this book, with its adorable Indian food, the elephant, the peacock and the female power was all kinds of brilliant. There wasn’t much writing, and I focused more on the illustrations, though. Here’s where it got a little trick for me, and the reason I’m not rating this book with 5 stars: THE TIMELINES WERE VAGUE. I don’t mean that this book wasn’t told in a non-linear style, because it WAS, it’s just that things in the book kept JUMPING AHEAD WITH NO WARNING. Or flashing back with no warning. - The novel, in the beginning kept jumping between days and occasions with NO WARNING. It would be the end of one day and with no “A few days later,” or “A few months later,” it jumped between Diwali, the birth of a baby, submitting and winning a contest and I WAS CONFUSED. - I also feel like the conclusion about the Pashmina and the Goddess Shakthi were also vague (or too complicated) and it could definitely have been done in a better, clearer fashion. 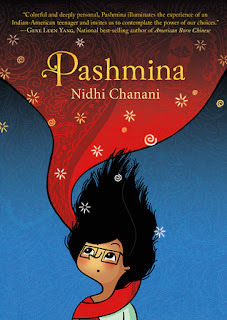 Pashmina, and especially the illustrations inside were ultra-cute (YES for diverse books with lots of food in them) and I would definitely recommend it. I just wish there were certain plot points that were explained in a clearer manner. 4 stars. Nidhi Chanani is an artist and author and the owner of Everyday Love Art. 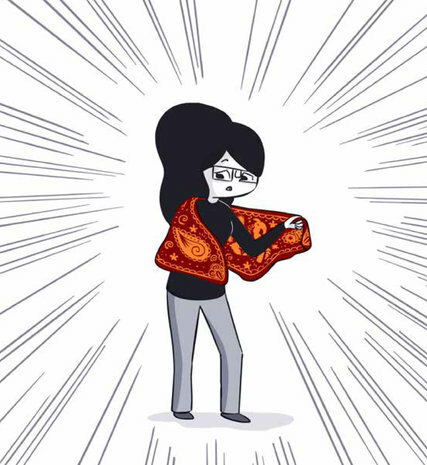 Her debut graphic novel, Pashmina, releases in October 2017. She recently illustrated Misty – The Proud Cloud, a children’s book by Hugh Howey. 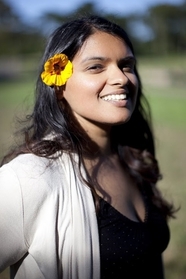 Nidhi was born in Calcutta and raised in suburban southern California. She creates because it makes her happy – with the hope that it can make others happy, too. In April of 2012 she was honored by the Obama Administration as a Champion of Change. Her media appearances include CNN’s Anderson Cooper 360 and BBC Radio. Her work has been featured on the Huffington Post, My Modern Met, Bored Panda, and India Times. Nidhi has worked with Disney, Paramount Pictures, ABC, Microsoft, State Farm Insurance and a variety of other clients. Everyday Love Art products are sold in retail shops across the country, including the San Francisco International Airport, Books Inc., and Therapy stores. Nidhi dreams and draws every day with her husband, daughter and their two cats in the San Francisco Bay Area. I don't read NEARLY enough of them and I'd love to change that!